Apartment Bella Vista is only 70 metres from the beach and 200 metres from the historic Korčula Old City. It presents air-cooled apartment with a view of the entire Old Town. 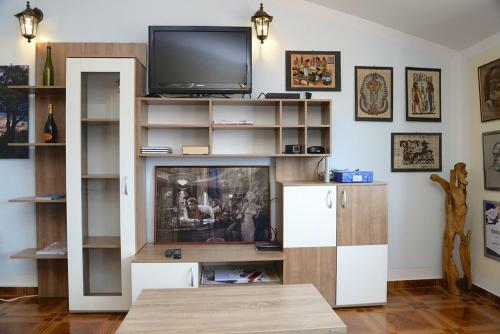 The apartment comprises a furnished balcony, a living room with a lcd tv and a well-equipped kitchen. Featuring a shower, private toilet also comes with towels. Breathtaking town and sea views can be enjoyed from all rooms. 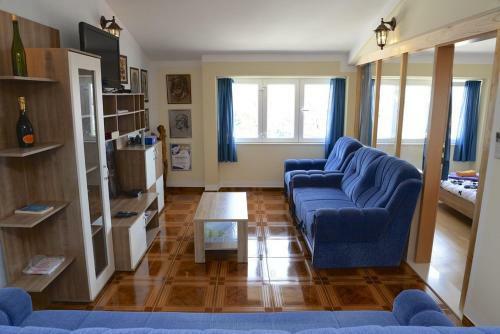 Apartment Bella Vista ~0.1 km, Korcula price per day from € 90 Apartment Bella Vista is only 70 metres from the beach and 200 metres from the historic Korčula Old City. It presents air-cooled apartment with a view of the entire Old Town. 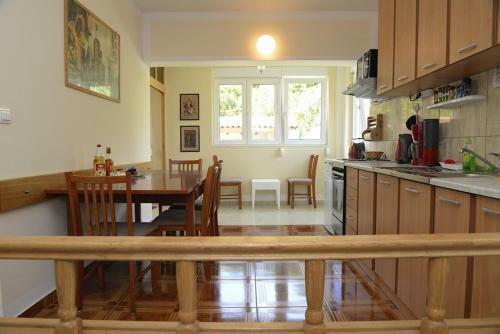 The apartment comprises a furnished balcony, a living room with a lcd tv and a well-equipped kitchen. Featuring a shower, private toilet also comes with towels. Breathtaking town and sea views can be enjoyed from all rooms. Guest house City Center ~0.1 km, Korcula price per day from € 40 Situated 100 metres from the historic core of Korčula, Bed and breakfast Town Center presents air-cooled accommodation with free internet access access. The property is 20 metres from a stone-paved beach and 100 metres from a pebbly beach. The accommodation units provide a LCD satellite television and a refrigerator. Each unit comes with a private toilet equipped with a shower. Some units come with an equipped kitchenette and a dining area. A dining establishment serving old-fashioned local food, as well as international meals, is set at a distance of 50 metres. 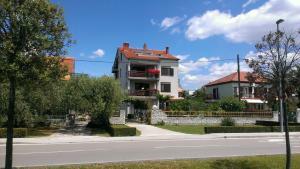 Apartments Ira ~0,1 km, Korcula price per day from € 30 Please inform Apartments Ira in advance of your expected arrival time. You can use the Special Requests box when booking, or contact the property directly with the contact details provided in your confirmation. 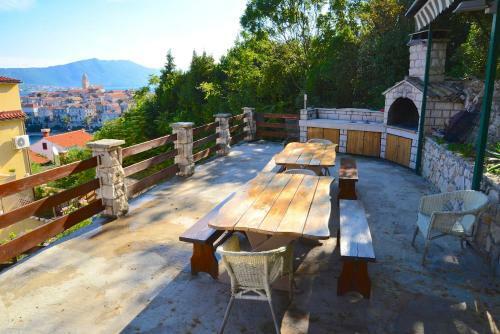 Premier View ~0,1 km, Korcula Providing a grill and views of the sea, Premier View is positioned in Korčula in the Korcula Island Region, 200 metres from Korčula Ferry Harbour. All units are air conditioned and feature a seating area. 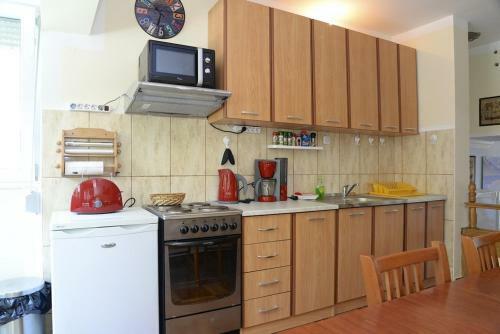 An oven and fridge are also featured, as well as a coffee machine. There is a private toilet with free toiletries in every unit. Blaise Citadel is 300 metres from Premier View, while Tower of Sea Gate is 300 metres away. Zrnovo ( ~ 1.9 km ): 109+ accommodation units. Lumbarda ( ~ 5 km ): 220+ apartments, 12+ villas, 2+ hotels. Pupnat ( ~ 7.9 km ): 21+ apartments. Racisce ( ~ 9.6 km ): 41+ apartments, 4+ villas. Zavalatica ( ~ 16.9 km ): 135+ accommodation units. Beach Kuciste ~ 1,9 km from Apartment Bella Vista Gravel beach: ideal for families, with restaurant, with caffe bar, equipped with showers. Excellent choice of watersports. Beach Fkk Badija, Korcula ~ 2,5 km from Apartment Bella Vista Rocky beach: with restaurant, with caffe bar. Nudism is allowed. Beach Viganj ~ 3,3 km from Apartment Bella Vista Gravel beach: ideal for families, with restaurant, with caffe bar, equipped with showers. Excellent choice of watersports. Beach Trstenica, Orebic ~ 4,8 km from Apartment Bella Vista Sandy beach: ideal for families, recommended for young people, with restaurant, with caffe bar, equipped with showers. Excellent choice of watersports. Beach Tatinja ~ 5,4 km from Apartment Bella Vista Sandy beach: ideal for families, with restaurant, with caffe bar. Excellent choice of watersports. Restaurant Konoba Belin, Zrnovo Guest reviews: 9,7/10 ~ 2,2 km from Apartment Bella Vista Address: Kb. 50, 20275, Zrnovo. Prices: 45 HRK - 112 HRK. Cuisine: Croatian cuisine. Restaurant Konoba Maslina, Korcula Town Guest reviews: 7,9/10 ~ 1,8 km from Apartment Bella Vista Address: Lumbarajska cesta SV.Anton, 20260, Korcula Town. Cuisine: Croatian cuisine. Restaurant Dusica Konoba, Korcula Island Guest reviews: 8/10 ~ 2,2 km from Apartment Bella Vista Cuisine: Croatian cuisine. Restaurant Konoba Malta, Korcula Island Guest reviews: 8,7/10 ~ 1,6 km from Apartment Bella Vista Cuisine: Croatian cuisine. Restaurant Hajduk1963, Korcula Town ~ 1,5 km from Apartment Bella Vista Address: Ulica 67 br.6., 20260, Korcula Town. Cuisine: Croatian cuisine.